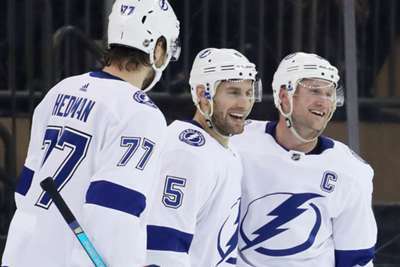 The Tampa Bay Lightning celebrated a rare milestone thanks to Monday's 5-2 victory over the Ottawa Senators. Tampa Bay became only the third NHL team ever to record 60 wins in a season. The Lightning join the Detroit Red Wings, who completed the feat in 1995-96, and the Montreal Canadiens (1976-77). Tampa Bay improved to 60-15-4 for the season following the win. They have just three regular-season games remaining. The Lightning clinched the top seed in the Atlantic Division on March 18, and earned the Presidents' Trophy – awarded to the NHL team that finish with the most points in the regular season.